Need the perfect gift and can't make up your mind? We have a great solution! TREOO Gift Vouchers are the perfect instant gift choice and super easy to give! Give the gift of choice from the heart. Simply fill out the form with all your details and we'll take care of the rest. Whether you choose to give any whole dollar amount, your recipient is guaranteed to find the convenience of shopping online anytime a dream come true! Remember, these Gift Vouchers can be activated and redeemed online only at www.treoo.com. Note: Choose "Collection @ Office (near Tai Seng MRT)" on the Checkout page so that you will not be charged for shipping. Any payment method is allowed. 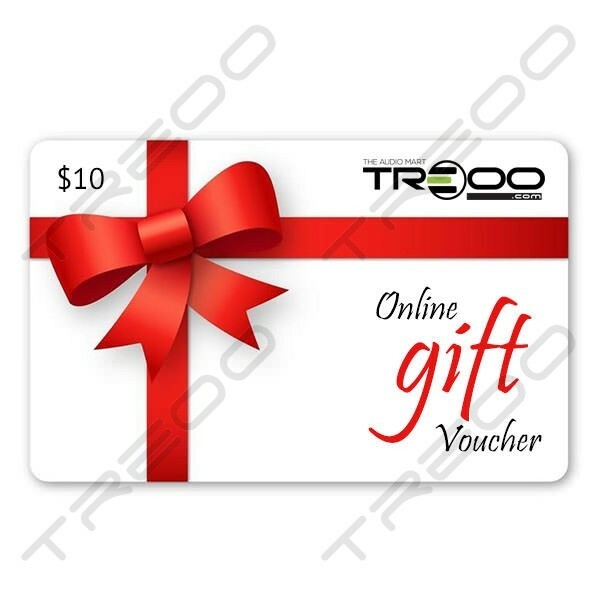 Online Gift Vouchers are redeemable online only at www.treoo.com. Gift Vouchers of any specified whole dollar value can be purchased. Gift Voucher are sent via e-mail to any individual with a valid e-mail address. The Gift Voucher e-mail contains a unique Coupon code which may be activated within 1 month from the date of receiving the e-mail. Note that Gift Vouchers may be redeemed for purchase of any items, including all sale items and restricted items. - Complete all necessary fields above. - Choose "COD at Office" during Checkout so that you will not be charged for shipping. Any payment method is allowed. - Complete your Checkout to confirm your purchase. - An order confirmation e-mail will be sent to you. - We will send the intended recipient an e-mail with all of the information needed to use the Gift Voucher at www.treoo.com. - Log in or Create an account if you do not have have an account. - Scroll down till you see "Coupon Activation"
- Enter your Coupon Code (codes are case sensitive) and click "Activate Coupon". - Your Coupon code will be activated and converted into Audio$ (100 Audio$ = 1 SGD$). Note that Audio$ are valid for 6 months from date of Gift Voucher activation. - Shop at www.treoo.com and select items you wish to purchase. - When you're ready to checkout, click "Add To Cart". - Proceed through the checkout process. - When choosing your Payment method, please "tick" the checkbox to 'use your Audio$'. - You cannot purchase an Online Gift Voucher with any coupon code or another Online Gift Voucher. - Gift Vouchers are non-transferable, non-refundable and are not redeemable for cash. - We cannot replace lost or stolen Gift Vouchers. - TREOO.com reserves the right to amend or cancel any incorrect Gift Voucher orders. - Unactivated Gift Vouchers beyond expiry will be forfeited and will not be refunded. - If you have any additional questions, please Contact Us.